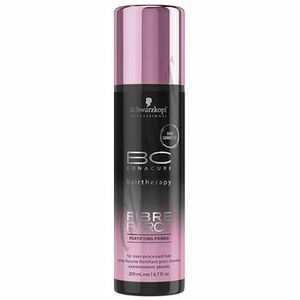 Great, shine-enhancing and conditioning treatment that restores weak hair. Schwarzkopf Professional BC Bonacure Fibre Force Fortifying Primer is a highly-nourishing leave-in conditioning treatment that uses a combination of 2 complexes that deeply reconstruct and seal each individual hair strand. This can offer hair up to 10 times more resistance to breakage. This primer is gentle enough to use on a daily basis and will protect hair from colour and heat damage whilst giving the appearance of healthy, strong and bouncy locks that have a beautiful shine. Simply apply to mid-lengths and ends of towel-dried hair and comb through your clients' hair. You can then leave it in and continue your styling as normal for revitalised locks. £11.10 (inc. VAT) Why no VAT? We're a trade wholesaler and quote our prices without VAT to help our VAT-registered customers understand the true cost of a purchase.